Chinese Literature: Essays, Articles, Reviews (CLEAR) is published annually. CLEAR journal is a leading resource for Chinese Literature academic discussion worldwide and has been published for over 30 years. Click below for two most recent CLEAR journal Table of Contents. 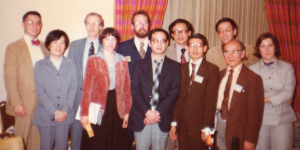 CLEAR was created based on discussions between eight scholars‒Eugene Eoyang, Joseph S. M. Lau, Leo Ou-fan Lee, Wu-chi Liu, Irving Lo, Ronald Miao, William H. Nienhauser, Jr., and William Schultz‒from the universities of Arizona, Indiana and Wisconsin spread over the early months of 1977. The journal was formally launched at a meeting on 18 March 1977 in Irving Lo’s living room in Bloomington, IN. Over the next year the founding editors, Eoyang and Nienhauser, received grants from the American Council of Learned Societies, the Association for Asian Studies, and the three affiliated universities as well as from members of the original editorial board (especially Elling Eide and Irving Lo) and individuals (especially Nancy C. Ing), allowing the production of the first two issues in 1979. Over the years CLEAR has published symposia, essays, articles, reviews and occasional forums on all aspects of traditional and modern Chinese literature. It is still the only western-language periodical devoted to Chinese literature. Having gained a worldwide reputation and audience, CLEAR now appears annually in December under the direction of editors Haun Saussy, Michelle Yeh and Rania Huntington. Characters on the website were written by Chow Tse-tsung (1916-2007).